Our children celebrate the Eucharist with the Rev. Rick Matters. What is Our Prayer & Vision for the Future? What Traits Do We Desire in a Rector? 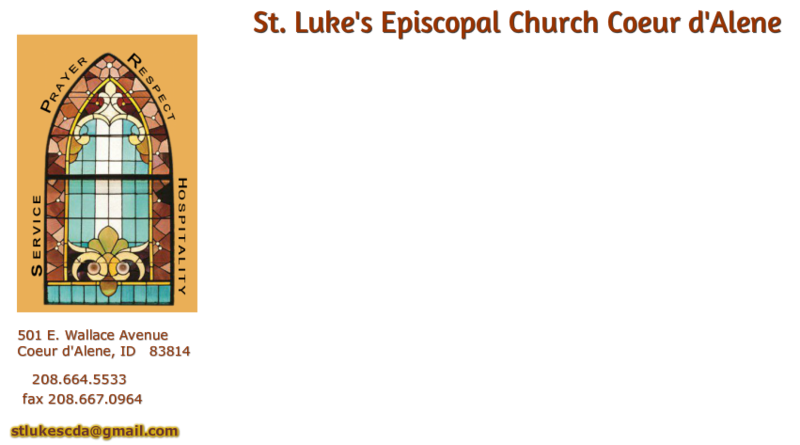 St. Luke's is a vibrant established church, striving to live our congregation’s core values of prayer, respect, hospitality and service. We seek a rector who will inspire and guide us in our quest to share Christ’s love, join us in caring for and nurturing each other, guide us to enhance and grow our many ministries, and help us maintain and expand our fiscal viability—a rector who will share our dreams and vision for St. Luke’s. Could we be the parish you are seeking? ​​Who are the People of St. Luke's? As a parish family we are engaged, energetic, curious, and socially conscious; an eclectic group of people who come together to worship God and pursue our shared dreams. We are artists, teachers, editors, musicians, attorneys, retired military, engineers, entrepreneurs, medical personnel, children, parents, and grandparents. We work together to accomplish our church goals. We are a vital and active group of people who are passionate about social outreach and support those in need, as is demonstrated through our many outreach ministries. We are blessed with strong, people-oriented, lay leadership in our congregation. However, we are exhibiting the strains of a church that is undergoing a prolonged search to find the right rector. (We have been without a priest for two-and-a-half years.) We have made progress and look forward to working on our issues as we pray for continued healing. We offer exceptional hospitality events such as themed parish dinners and entertainment to enhance friendships and raise funds for outreach. We know how to have fun in the spirit of fellowship! Could we be your people? Members of St. Luke's Men's Group take the kids from St. Vincent de Paul fishing every summer. What Is Our Prayer and Vision for the Future? We celebrated 125 years of worship in 2017 and look forward to continuing our energetic involvement in the church and community, living out our Christian call to show the love of Christ to all we encounter by what we say and, more importantly, by what we do. We plan to build on the good work we are doing. 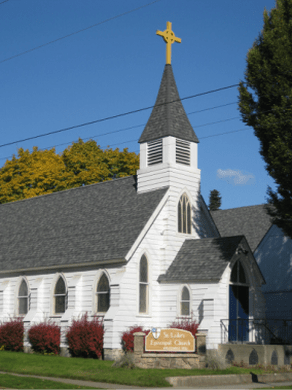 In 2011 we formed a congregational development plan that focused on growing with retirees who are moving to Coeur d’Alene. A 2016 survey by Holy Cow Consulting expressed our desire to grow a multi-generational church, especially since membership with young families had grown. We engaged in a visioning exercise in which parish members expressed their dreams—both personal and as a church—through mentored discussions and in other ways. This told us that we want our church to be a place of harmony and respite where we can find spiritual fulfillment in the presence of the Holy Spirit. We want to be a church that stands for love and justice, that is a platform for helping the less fortunate, and a church that offers community both in good times and difficult ones. We are growing our church into a multi-generational congregation. We attract families with children and youth with our Jordan and Well services. A big dream is to eventually have programs for teenagers. We desire to more fully incorporate all parishioners into the life of our church. We yearn to enhance our spiritual development. Spirituality is very personal, so we need a variety of opportunities including continuing education, Bible/book studies, and sermons that encourage deeper thinking. In addition, we wish to further develop the generosity of our members to financially support the ministries of our church. Do you identify with our vision? Exhibits inspirational preaching to deepen our connection with God through the love of Jesus Christ. Has strong people skills; can collaborate with, and draw upon, the strengths of our members and staff while leading us forward and celebrating our differences. Can help to integrate a growing multi-generational church—who is equally comfortable visiting with the elderly as well as bouncing around with three-year-olds—and has a strong interest in helping us enlarge our youth programs. We are looking for someone who can provide innovative ideas and lead us into the future. Is invested in the life of our parish. Is an effective and efficient administrator. Provides pastoral care to all members who desire it. Inspires financial giving and can offer creative ideas to develop the generosity of our congregation. Could you be our next partner in ministry? St. Luke’s worship follows traditional Episcopal liturgies in the Book of Common Prayer and is centered on the Holy Eucharist. The Sunday 8 a.m. service is Rite I. The 10:30 service is Rite II with music. We celebrate Morning Prayer when no priest is available. One opportunity for our new rector will be incorporating the new generations joining us, while respecting the traditions that are so dear to us. We hold family services on Sunday morning at 9. The Well and Jordan are interactive and energetic services for pre-school, elementary, and middle-school-age children that follow a modified version of Holy Eucharist Rite II with contemporary children’s songs, Bible readings and stories, prayers and activities. In 2018 we added a Thursday-evening contemplative service that offers meditation and reflection based around Centering Prayer, the labyrinth, and other practices. Music is an important part of worship at St. Luke’s. We have a new Allen organ and modern sound system. Our outstanding chancel and handbell choirs are led by our music director, who has a master’s degree in organ performance. We enjoy music every week at 10:30. Several of our choir members also perform in community music groups. We cherish the history and traditions of the Episcopal church and our customary worship is in the church with the Book of Common Prayer. But other forms of Anglican worship can also be beautiful and now and then we enjoy non-standard services. St. Luke’s members believe in the importance of lifelong learning. We offer the four-year Education for Ministry program and periodically conduct “Basic E,” an introductory course to the Episcopal Church and St. Luke’s parish. We offer occasional book and Bible study short courses and recently started a breakfast group to discuss the weekly lection. Parishioners enjoy "cookie hour" after our Well and Jordan services. Ministry and outreach are two of the strongest facets of our parish life. We believe in living out our Christian calling by sharing the love of Jesus Christ. We do a lot for those within the church, caring for each other, as well as reaching out to our community. We have a large and vital volunteer base and many lay ministries. We have a corps of Eucharistic and pastoral visitors who carry the parish with them as a sign of the whole community’s care, support, and concern for absent members. Our vibrant prayer chain and prayer shawl ministries keep our members and those we care for before God, while our Daughters of the King chapter offers services to members of St. Luke’s and the wider community. St. Luke’s is actively involved in giving back to our community through numerous ministries and programs. We donate space in our lower level for Family Promise of North Idaho, a non-profit organization that helps homeless families. Our mutual relationship benefits us both. We support local shelters and partner with a local elementary school to provide mentoring and tutoring in reading and math. We make our parish hall and basement rooms available to others, such as multiple 12-step programs, community art programs, Boy and Girl Scout groups, and more. We recently became the sponsor of a Venturing Crew, a coed program of the Boy Scouts of America for teenagers and young adults. We have a community vegetable garden that is available to the neighborhood and furnishes produce to local food banks. We also collect food items each Sunday and have started a new “Food for Friends” ministry which supplies and packages individual meals for the hungry. St. Luke’s hospitality engages the parish and helps to make us a friendly place. An active Welcoming/Involving Committee, St. Luke’s Guild, and Men’s Group provide numerous opportunities to meet socially and undertake church projects. Numerous social meals and programs at St. Luke’s raise money and enable us to reach out to neighbors and the community. We have 187 members. Total attendance at all services in the first half of 2018 was 2,504, with an average Sunday attendance of 100. St. Luke’s has a strong financial team that manages the parish finances in a frugal manner. We have managed to build up and fund a modest long-term investment strategy, but the challenge ahead is how to balance the income realities with the human resources needed to support the operations many members have come to expect. We need a priest at St. Luke’s who is resourceful and creative in helping us with this work. Our city grew up around Fort Sherman, which was founded near Lake Coeur d’Alene to protect settlements after the Battle of the Little Bighorn in 1876. Many of the officers and wives at this federal outpost were Episcopalians who started meeting in 1891 and built the church the following year. A parish hall and office area were added later. Our church holds about 140 people. Our columbarian alcove is nicely landscaped, as is our parking lot across the street. We own a newly remodeled house next door which provides rental income. We have continued to modernize our facilities over the years while still maintaining the character of one of the oldest churches in town. In the past ten years we put on a new roof, installed a new HVAC system, and renovated the office and parish hall. To conclude, we are proud of our active, dynamic church, our committed lay leadership and faithful workers. Even without a permanent priest we are strong in the love of God and service to the Lord, each other, the community, and the world. We trust and pray our new rector will help us sustain our strengths and realize our dreams. Located at the north end of what National Geographic has described as “one of the ten most beautiful lakes in the United States,” Coeur d’Alene is known for year-round, world-class outdoor pursuits. It is a family-friendly small city with excellent schools and many opportunities for children and parents. Coeur d’Alene features emerging new businesses and a higher education corridor that includes North Idaho College, the University of Idaho, Lewis-Clark State College, Boise State University, and Idaho State University. The city’s outstanding medical facilities are headed by Kootenai Health, a member of the Mayo Clinic Care Network. There are growing cultural opportunities such as a symphony, opera and theater performances, art galleries, and museums. Coeur d’Alene is only 35 minutes from Spokane, Washington, putting the amenities of a much larger city within easy reach. The area has seen a population increase of more than 20% in recent years and is one of Idaho’s fastest growing regions.